It is the journey of a lifetime, filled with awe-inspiring new places and people, each day a fresh adventure. But chaos and betrayal plague him at every turn, and Eragon isn't sure whom he can trust. Meanwhile, his cousin Roran must fight a new battle back home in Carvahall - one that puts Eragon in even graver danger. Will the king's dark hand strangle all resistance? Eragon may not escape with even his life. While Eragon travels to Ellesméra to train as a dragon rider with the elves, his cousin Roran has troubles at home. Ra’zac come back for him, but since he doesn’t present himself and the villagers won’t hand him over, fighting begins. Soon Roran’s fiancée is kidnapped and Roran convinces almost the entire village to follow after the kidnappers. They travel south where they meet with Brom’s friend Jeod. He explains Eragon’s new role as a dragon rider and helps Roran and the villagers escape on a stolen ship. They manage to escape to Surda to join the Varden in fight with the king. Meanwhile Eragon trains hard and becomes smitten with Arya who refuses him after the Agaetí Blödhren where Eragon is turned into half elf. Eragon leaves his training behind and travels south to Surda to help the Varden in their fight. Together, Varden, Eragon and Roran – with his village – defeat the king’s forces, but not before Eragon has a fight with a mystery evil rider – Murtagh. Eragon loses but Murtagh spares him due to their old friendship. Murtagh also reveals they are brothers before he escapes. Eragon and Roran reunite and decide to go rescue Roran’s fiancée. In the fight that was going down in Farthen Dûr Ajihad is killed with Murtagh and The Twins gone – they’re all assumed dead as well. At his funeral, Ajihad’s daughter Nasuada is elected to command the Varden and Eragon pledges to her. Eragon and Saphira decide to travel to the forest Du Weldenvarden so Eragon can become trained as a dragon rider by the elves. The dwarf king, Hrothgar, who lives in Farthen Dûr, decides to adopt Eragon to his clan, Durgrimst Ingeitum, and have Orik accompany him to the forest along with Arya. Meanwhile, Roran returns to Carvahall and comes to realization that Garrow died because of Eragon bringing home the blue stone. He is also trying to get approval by Sloan the butcher because he wants to marry his daughter Katrina. Soon Roran and Baldor, one of Horst’s (smith) sons, spot the Ra’zac and thirty Imperial soldiers camped nearby. Roran hides in the Spine. Roran hears from one of Horst’s sons, Albriech, that the brewer, Quimby, is dead and that he was eaten by the Ra’zac. Roran and several other men decide to fight back. They build a wall against the Ra’zac and there is another battle. Roran and Katrina are finally engaged. The Ra’zac say that they will enslave the villagers if they give up Roran, and if they don’t give Roran up, the villagers will all be killed. The entire village then sets up defenses, and during a second invasion, the Ra’zac escape again. One night, Roran wakes up to find Katrina being attacked by the Ra’zac. A Ra’zac bites Roran, leaving a serious injury, and leave with Katrina. While Roran is chasing them, Sloan, Katrina’s father, betrays the village and joins the Ra’zac. The Ra’zac escape with Katrina on their mounts, the Lethrblaka. While traveling, Eragon and the company goes through the mountains where other dwarves live. They stop at a dwarf city called Tarnag. Eragon visits a dwarf temple, Celbedeil, where he learns about their religion and gods. The rest of the journey is pretty uneventful; Eragon learns about dwarves and animals they meet and Arya shows Eragon how to act among elves. They travel until they reach Ceris, an elven outpost. Two elves accompany the group to Ellesméra. Meanwhile, Nasuada chooses to move the Varden from Tronjheim to Surda in the south to mount an attack on the Empire. The Varden are in bad financial troubles, however, until Nasuada learns that she can create an expensive lace with magic, and sell it at extremely low rates to counter other merchants in Alagaësia and gather all the profits herself to finance the army. There is also a failed attempt on Nasuada’s life and she learns that the fight will come sooner than expected. 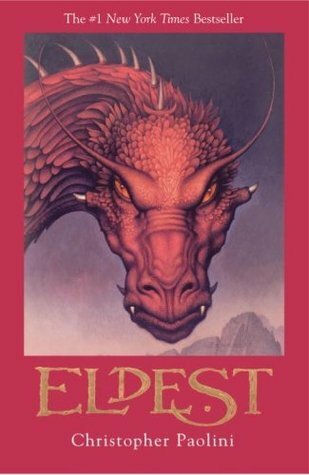 Once they reach the forest, Eragon meets Oromis, ‘The Cripple Who Is Whole’, and his Dragon Glaedr, the only dragon and its rider secretly alive besides Eragon and Saphira, and Galbatorix and his dragon Shruikan. Eragon and Saphira are taught the use of logic, magic theory, scholarship, and combat, among other things. He becomes fluent in the Ancient Language. Every day he fights with an elf named Vanir. Eragon continues his training, but is having troubles with the scar on his back that causes him to have hurting seizures. He is swooning over Arya throughout his time in Ellesméra, while Saphira also has a similar problem with Glaedr, as she finds him to be a good choice for a mate. Both efforts fail miserably, but bring Eragon and Saphira closer together. Later, at the ancient elven ceremony, the Agaetí Blödhren (Blood-Oath Celebration) in honor of the riders, Eragon is affected by a spectral dragon. The change alters his senses, and enhances his abilities, turning him into an elf-human, as well as heals all of his wounds, scars, and back injury. Eragon continues training until he learns that the Empire will soon attack the Varden in Surda. After the ceremony he confesses his feelings for Arya who rejects him harshly. Eragon leaves without completing his training, to help the Varden. Meanwhile, Roran is trying to rescue Katrina. He decides the only solution is to join the Varden in Surda, and convinces almost the entire village to travel south. The village reaches Narda by the coast, where they pay for barges to sail to Teirm. In Teirm, Roran meets Jeod, Brom’s friend, who tells him about Eragon’s adventures and his new role as dragon rider. In the mean time, Eragon arrives at the Varden’s camp, who is under attack by Galbatorix’s soldiers. A group of Urgals join the Varden and an unknown dragon rider appears to help the Empire’s forces. The unknown rider kills the dwarf king and begins to fight with Eragon. The rider is quickly unveiled by Eragon and is revealed to be Murtagh. Murtagh tells Eragon that he was kidnapped and forced into loyalty by Galbatorix after a dragon hatched for him. Murtagh outmatches Eragon, but shows mercy due to their old friendship. Before leaving, Murtagh reveals that Eragon is his brother, and takes Eragon’s sword as well. Murtagh also reveals that Galbatorix is working to save the dragon race and reestablish the riders; but in order to do this, he must capture Saphira, who is the last female dragon in existence. Ultimately, Galbatorix’s army is forced to retreat due to heavy losses, after the arrival of the dwarves and the village of Carvahall and the departure of Murtagh. Roran manages to defeat the traitorous Twins by bashing them in the heads with his hammer. In the end, Eragon reunites with Roran and decides to help Roran rescue Katrina from the Ra’zac in Dras-Leona.